Fishing for steelhead in Pennsylvania is very popular in the spring and fall. One of the most exciting fish to catch, the mighty steelhead, known for it’s acrobatic leaps and reel screaming runs. They can truly get a fisherman’s adrenaline running. The main techniques used to catch these feisty fish is fly fishing and drift fishing. For anglers that prefer fly fishing, fly rods in the 7 to 8 weight are most often used, weight forward floating fly lines of matching weight and a variety of trout flies. 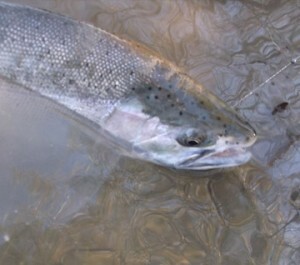 Woolly buggers, nymphs, stoneflies, egg imitations, egg sucking leeches and crystal buggers can all produce numbers of steelhead. Streamers are also deadly especially patterns with pink and white. Drift fishing is also a popular technique for steelhead, and generally uses long noodle rods, center pin or spinning reels, a float, and small sharp hooks, sizes 12, 14, 16 and 18. Small split shot is added to a light leader, usually a few inches apart so the bait bounces along the bottom in a natural presentation. The most common bait used is roe, although worms can also produce good steelhead numbers. Elk creek is one of the largest rivers in Pennsylvania and also one of the most popular. Some of the more well known steelhead spots include the mouth of Elk Creek, the Legion Hole and the Conrail Tubes on the lower sections of the creek. In the upper stretches, Foley’s End and Streuchen Flats are also very productive areas. Walnut Creek is the second largest system in Erie Pennsylvania and also has a very good run of steelhead. The main access point and most popular fishing area is Walnut Creek Marina. This section can get very busy with fisherman, shoulder to shoulder especially during the peak time of the steelhead runs. Twenty Mile is also a good steelhead stream. Access is along route 5 and most anglers fish the mouth area. Additional fishing opportunities can be found in a number of small streams that run by route 5. These include Raccoon, Godrey, Trout, Cascade, Four Mile, Seven Mile and Sixteen Mile creek. Steelhead fishing in Pennsylvania is one of the most popular forms of fishing in the state, with many anglers coming from far and aboard. The fishery is one of the best along the shores of Lake Erie. Get out and try your luck, you might be rewarded with a trophy steelhead.